Gerashchenko speaking with reporters Wednesday at the Duma. Lawmakers accepted his resignation from the Central Bank. Russia's Hercules has finally met his match. The State Duma on Wednesday accepted the resignation of Viktor "Gerakl" Gerashchenko from his post as chairman of the Central Bank, ending an era in which the portly banker showed Herculean strength in defending the Central Bank and the entire banking sector from pressure to reform. Duma lawmakers quickly approved the appointment of President Vladimir Putin's candidate to the unwieldy mammoth, the lanky First Deputy Finance Minister Sergei Ignatyev. Ignatyev is said to be a diligent number-cruncher who is not against toeing the Kremlin line. Gerashchenko -- who has been called "one of the funniest bankers" and "the worst central banker in the world" -- told the Duma that his resignation was the result of "pragmatic considerations." "I did not want to work another [five-year] term and leave the post when I am 69," he said, according to Itar-Tass. "I spoke about this with the president, who agreed with me and offered to appoint a new Central Bank chairman right now rather than waiting until September." Lawmakers presented him with a small bouquet of flowers. Gerashchenko has not said what he will do next. Some say he has done enough in a banking career that has spanned four decades. Those who have worked with or interviewed Gerashchenko call him fierce and quick-witted, if sometimes profane. He once introduced a foreign economist "come to reform Russia" to his "good friend" Gennady Zyuganov, the leader of the Communist Party. He has sprinkled interviews with references to Western movies. At an anniversary bash for Sberbank, the Central Bank-controlled retail monopoly, he raised his glass with the toast: "Long live Sberbank ... [pause] ... and its major shareholder." "Gerashchenko's main achievement is that he headed the Central Bank four times," said Boris Fyodorov, who has been an outspoken critic of Gerashchenko since his days as finance minister in the early 1990s. "His second achievement is that by the end of his time, the end of the decade, he came to understand that Central Bank independence is extremely important. I personally don't know of any others," said Fyodorov, who is now honorary chairman of United Financial Group. Others say he deserves more credit than he has gotten. "Gerashchenko has been underestimated," said Christof Ruhl, chief economist at the World Bank in Russia. "This is man who was a banker for a long time before and spent much of his professional life outside the U.S.S.R., so it is not plausible that he didn't know what he was doing." Since 1998, Gerashchenko has helped restore ruble stability, almost tripled the country's hard currency and gold reserves to $37 billion and fiercely defended the Central Bank's independence, a strategy that may have been meant to atone for earlier sins that fed destructive hyperinflation. He was sacked after the ruble lost 30 percent of its value on Oct. 11, 1994, a day dubbed Black Tuesday. "He was printing huge amounts of money, feeding hyperinflation and, in that sense, taking part in the destruction of the Russian economy," said Peter Westin, economist at Aton. "In 1998, we were expecting the same -- mass printing, high inflation -- but he didn't do that. He acted prudently on the monetary side." Four years on, however, the stable ruble policy is under fire for making domestic industries less price competitive. There have been signs over the past year that "Gerakl's" strength was weakening. He failed to defend the mandatory 75 percent repatriation of export proceeds -- a scheme he set up in 1998 that diverted rivers of hard currency into the Central Bank's reserves -- from being slashed to 50 percent. He failed to win a reprieve on the Central Bank's divestiture from Vneshtorgbank, set for January 2003, despite an 11th-hour push from the Duma to move the deadline to 2005. Gerashchenko fiercely opposed a bill on the Central Bank that is currently stuck in the Duma, calling amendments "unconstitutional" and "stupid." The crucial second reading has been postponed time and again, and each time, amendments that he found odious -- divestiture from overseas banks, a National Banking Council fully endowed with oversight powers -- disappeared or were watered down. The very independence of the Central Bank may have led to Gerashchenko's downfall. Putin has not looked kindly on other impenetrable, state-connected fortresses such as Gazprom and the Railways Ministry, both of saw their chiefs sacked in the past year. Banking reform appears to be the next item on the government's agenda, but little could be done while Gerashchenko controlled the sector's regulator. "He had a deficit of ideas in terms of bank system reform. He knew what not to do and could explain why very professionally, but he had no constructive ideas," said Mikhail Matovnikov, deputy director of Interfax Rating Agency. "But it is not a fact that his replacement will have better ideas. There is a high uncertainty factor." In August 2000, Gerashchenko was awarded the Service to the Fatherland order of the third degree "for significant personal investment in the development of the Russian banking system," an irony worthy of his sense of humor. In 1967, Gerashchenko was transferred to the Beirut branch of Moscow Narodny Bank as deputy director, and he left five years later as director. He moved to West Germany to head Ost-West Handelsbank in 1974. In 1977, he was asked to shore up Moscow Narodny Bank's Singapore branch, where poor credit practices had pushed it to the verge of collapse, according to the book "State Elite." 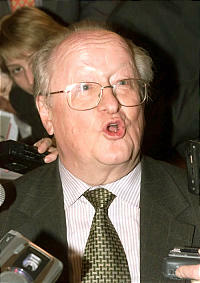 After returning to Moscow and moving up the chain of command at Vneshtorgbank, Gerashchenko was named head of Gosbank in May 1989. He stepped down in January 1991, only to be invited back in 1992 as the Soviet system was crumbling and the state bank broke into a dozen pieces. "He was the right person at the right place for a short time and that time ended awhile ago," said Kim Iskyan, banking analyst at Renaissance Capital.